Democratic Rep. Luis Gutierrez took to the House floor on Thursday to refute the claims of Republican presidential contender Newt Gingrich that President Obama is the "food stamp president." The Illinois politician brought a portrait of former President George Bush and mounted it on the House floor. "I have to admit that when Newt Gingrich first used the phrase 'the food stamp president,' I was outraged," Gutierrez said. "But then I started looking at the facts, I did my homework, I crunched the numbers, and I have to admit, 'food stamp president' might be on target." He then pointed at the portrait and said, "And here we have him, the food stamp president of the United States: George W. Bush," he said, before calling Bush's father, George H.W. Bush, the "food stamp president Sr.," given the increase in food stamp spending under that president, too. 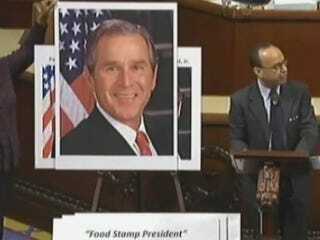 "It's hereditary, a rampant disease that makes them want to feed poor people," Gutierrez said. The Huffington Post reports that under both Bushes, the cost of the food stamp program increased by $36 billion, while 18 million more people began using food stamps. According to USA Today, 14.2 million recipients have been added to the program under President Obama.